No, I am not prepping for November. In fact, this has nothing to do with NaNoWriMo but I will take a moment to wish the best of luck to all of you who are signed up for it. For me it simply means no write. I haven’t been writing the last two weeks nor have I even made an attempt to post a blog until today. This weekend might be different for a few hours early Sunday morning and allow me to get a few words in before anyone gets up. The rest of the day will be more of the same thing I have been experiencing: no writing. These last two weeks life has gotten in the way. I will accurately predict that life is going to get in the way for the next two or three weeks as well. I should probably rephrase that since it conveys a negative connotation. Life has gotten/will get in the way in a wonderful manner. My son’s life. My son’s future. My priorities? Family, job, writing, and then everything else and in that order. My WIP will still be there in a few weeks. For now, I consider myself very fortunate to be having life get in the way. May 2012. My son had just finished his JV Baseball season and was meeting his teammates so they could all turn in their baseball jerseys to the coaching staff. The kids decided to play a pickup game of basketball afterwards in the gym and my son got hurt. He suffered a minor concussion and fractured some weird bone near his wrist and thumb that would have him wearing a cast for a good part of the summer. A cast that went all the way to his bicep. His plans for junior league summer baseball gone. A few weeks later, he got an excuse from the doctor allowing him to participate in gym class doing lower body exercises. This was important because his gym teacher was giving him a zero for every gym class he couldn’t participate in. Yes, that kind of gym teacher. Allowing him to do lower body exercise meant he could work out in the gym or walk for extra credit to make up for the two weeks of zeroes. My son felt lower body exercise also meant he could play indoor soccer in gym class and his gym teacher let him. Bad decision. An hour later the school nurse was calling me to pick up my son. He had gotten clocked in the head with a soccer ball that put him flat on his back. He was in the nurse’s office when I got there and was somewhat out of it. After a trip to the doctor and some tests at the hospital we found out he had just gotten his second concussion, and only a few days before finals and regents. Two concussions in less than a three week span. With the help and understanding of his teachers and the school nurse, he got through all his testing and surprisingly pulled good grades and finished his freshman year. The next few weeks were trying in that he would get massive headaches and just cry. He was acting weird, doing things he hadn’t done before, saying things that were inappropriate, and although funny now, he was listening to country music after listening to nothing but rock and rap. For lack of a better way to describe it, it was like he had no “shut off” switch and had regressed three or so years. My wife, having just finished nursing school, was very understanding and in tune with what was going on with his condition. I, on the other hand, was in complete denial about how serious his concussion was. As for my son, his only worry was soccer camp would be starting in a few months and he was going to be pulled up to varsity as a sophomore. Or so he thought. I had to run into town to get a few groceries one morning and my son wanted to come with me. On the way in, he found the country station on the radio and I had to listen to him singing along to “something bout a truck” as it blared over the speakers. As we were standing in the checkout line, my son asked for tea. He had been drinking a lot of tea lately. He then went on a rant, a very loud rant, about all the flavors of Arizona Tea and how Arizona Tea was not from Arizona, but we are from Arizona, and now we are in New York, and Arizona Tea is from New York, and “isn’t that ironic dad, isn’t it, isn’t it” and on and on and on… all while curious customers looked on. I let him grab multiple cans of cold Arizona Tea and checked out. Groceries now loaded in the car we drove home, me very quiet and him singing to country music between sips of his Arizona Tea. When we got home, I went in my bedroom, closed the door and I cried. I cried like I hadn’t cried in years and at that moment, I could have cared less if my son ever played a sport again. I just wanted him back. I wanted him back to normal and I was scared. Sports were important to him and like any supportive parent, important to me because they were important to him. I’m not living vicariously through him. I played baseball and football as a kid. I never even watched soccer until my son decided he wanted to play and because of that we have grown to love the game. I grew up thinking soccer was for the sissy kids – west coast, different time, different era and my own teenage ignorance at the time. Towards the end of summer, our doctor released our son to play soccer with one stipulation: no heading the ball. My wife and I discussed whether or not we even were going to let him play. His head, or more specifically his brain, is what mattered to us and his brain is what would be opening doors to college, not sports. Through many family discussions and my son pleading with us to let him play, we agreed, provided he wear this special head band designed to reduce the impact of a ball to the head and that he in no way heads the ball. There would be no moving up to varsity for my son but the JV coach was extremely happy to have my son again on his team. He played the entire year on defense without heading the ball once and was selected as MVP for his team: on offense. Yes you read that right. He scored more goals than any other offensive player despite playing defense. He went on to play baseball that year both for his high school and for a Senior League team over the summer that ended up winning the NY State Championship. 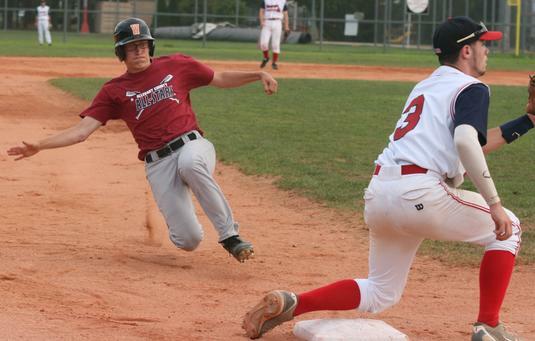 His team went on to the East Coast Regional and performed respectively losing to a team that went on to play in the Senior League World Series Championship game in Maine. My son wanted to play in that game just to play in the beautiful stadium that was largely paid for by a famous author we all know: Mr. King himself. 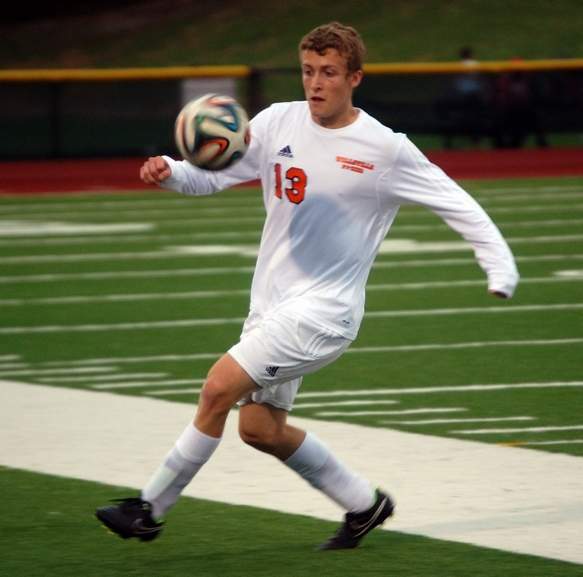 His junior year in HS, he moved up to varsity soccer. He refused to wear his “special” head gear but told us he wouldn’t head the ball. He lied, but only a little. I can count the times on both hands that he headed the ball that year. For spring, he decided to do something different. He ran track after playing baseball for ten years. I think he felt it would be tough to top the high he experienced being a state champion the previous summer in baseball. By now you all are thinking this entire post is a father bragging about his athletic son. Wrong. Friday October 17th was my son’s final home game during the regular soccer season. His high school has a tradition called senior night for every sport. For soccer, prior to the game, each senior is escorted onto the field by their parents. The announcer introduces the athlete and his parents, then goes on to list all the sports they have played in high school. The announcer also states the future plans for the student athlete, advice the player has for underclassman, and a statement the player has for his fellow seniors. The event is somewhat bittersweet for most athletes and parents because often it is the last time the student will play on his home field. Our team won that night so it seeded them higher for sectionals meaning one more home game at a minimum. When they announced my son, they announced he had played JV soccer for two years, Varsity Soccer for two years, JV baseball for two years, and Track for one year. The announcer then went on to say my son was going to pursue a career in the medical field. He wants to be a Physician Assistant or Nurse Practitioner. What wasn’t announced is that in addition to playing sports, my son is ranked third in his graduating class, has an extremely high GPA, played in the concert band, played in a jazz band, sang in choir, performed in a school musical, sings in an a cappella group, in National Honor Society, is in student council, has taken both honors and AP classes, has taken numerous college classes, was selected to NY Boys State this past summer, and was selected to a pre-med program for high school seniors that takes up half his day then returns to his high school for three classes in the afternoon. He is also being recruited by literally a few dozen schools for academics. As my wife and I stood on the field with my son, I was proud. Proud of what he has done in high school, proud of the young man he is becoming. 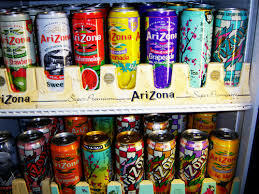 And walking to the stands, I fought to hold back the tears as I remembered a very vocal rant about Arizona Tea a few years earlier one Saturday morning in the checkout line. The next morning my family was up at 5:00 to drive two hours for an open house at my my son’s first choice college. He is applying to their PA program. This is part of his plan A. He will apply to four schools that have PA programs and are within a few hours drive. If accepted, each one has assured us they are willing to offer him a substantial scholarship based on his class standing, GPA, and SAT/ACT scores. Plan B should he not get accepted? He attends any of those same schools or others, pursues some sort of bio medical undergrad degree and continues to apply to the PA program as a transfer or to a school that has a Nurse Practitioner program. The difference will be a five year BS/MS PA program versus a potential seven year program (and more money). Either way, I’m confident he will succeed. So this is what has been taking up our time: college applications, essays, scheduling visits, developing alternative plans, etc. I’m praying my son gets his first choice. He deserves it. He’s not perfect. In fact, there are plenty of times his mother and I get angry with him. He’s a teenager. We take the good with the bad and the good far outweighs the bad. That first choice school he wants so desperately to be accepted into is a Division III school and just happens to have a soccer program that sucked. Two years ago they had eight players on the team and begged kids to play. This year they had twenty five players and did win some games. If selected to the school, my son will try and make the team and most likely would according to a few of the players he talked to during our school visit. My son doesn’t care how good the team is. 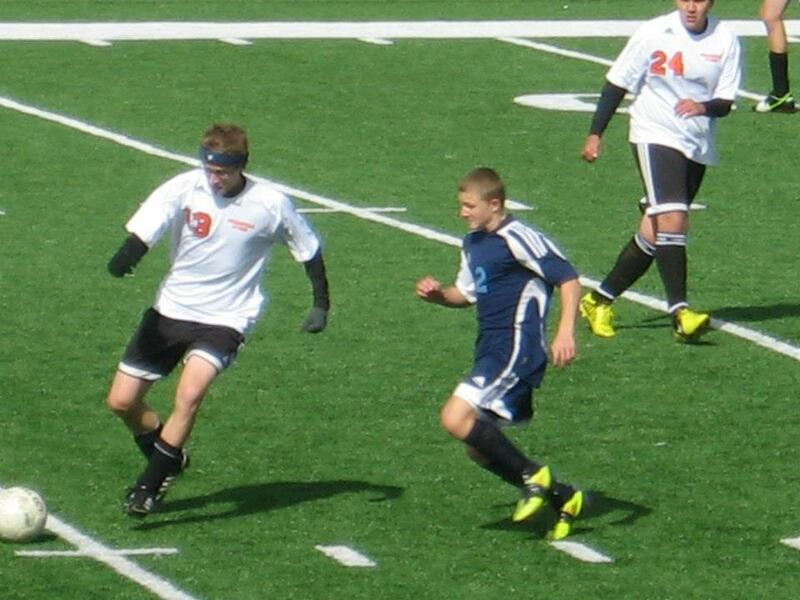 He just loves to play and the realization that he could be playing soccer in college is exciting. You see, my son is not your typical “skilled” soccer player. His coach once told him he had no soccer skills at all. What he lacks in skills, he makes up for in being aggressive and his passion for the sport. He is also extremely fast and rarely gets beat. This is why he plays every minute of each game. That passion is what my son has for everything he attempts and that is what soccer means to me. Watching him play soccer captures every personality trait he possesses that has helped him excel academically and in his other extra-curricular activities. That passion is what I hope my son expresses in the 750 word essay he will submit to earn an interview. And if he gets that far, hopefully that same passion will be prevalent during the interview and lead to his acceptance into the school of his choice. I only pray that the individuals that make up the selection committee see the same kid with passion that I and so many others see. As I write this, my son is at his school re-taking his ACT in an attempt to get one point higher than he got the on the first attempt. That one point means additional scholarship money to one of his plan B schools. After that he has a cappella practice for three hours then comes home to rest for an hour before we head to his second sectional soccer game. His team won the first one on Wednesday night against a team they were expected to beat. Tonight they will be playing a team that is only seeded slightly below them. It could very well be his last soccer game in high school and I am going to soak in every minute of it. Win or lose, my son will play with passion. Liam, if you ever read this – I love you and couldn’t be more proud of you. May you never lose your passion. UPDATE – 10.31.14. My son’s team won their sectional game last Saturday on his home field. If you understand playoff brackets, this put them in the semi-finals, which basically means the final four teams out of sixteen teams. On Wednesday evening of this week, his team played against the #1 ranked team in our section and I believe the #4 ranked team in the state. We had to travel to a neutral field about an hour away. They were 0-0 at the half, 1-1 at the end of regulation, then lost 2-1 in overtime. It was an amazing game despite the loss. 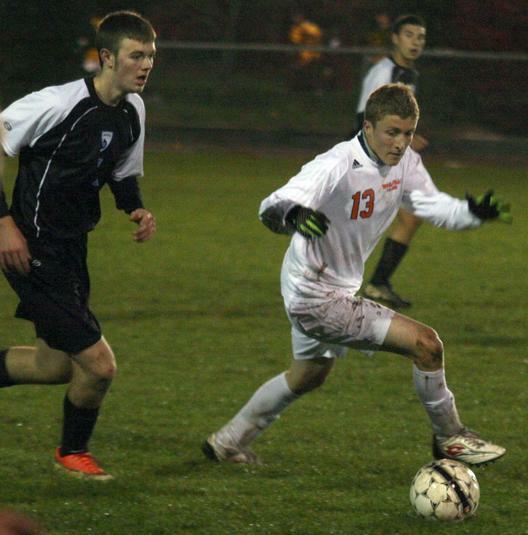 His last High School soccer game. He was depressed for the bus ride home to the school, and depressed on the ride from his school to our house. We got home around 10:15. My son dropped his soccer bag off on the stairs, and continued over to the computer with his school bag. He let the game go and worked on homework until midnight while my wife quizzed him on medical terms. What a beautiful, thoughtful and, dare I say it :), passionate post. I can see he gets some of his passion from his father. I wish him every success for the future. What an awesome post! Congratulations to the whole family, getting through times and recognizing and developing the passion to live fully. Head injuries are scary and I’m glad you’ve all come through that. Stroke patients also talk about losing that emotional and thought barrier, often saying things they would have been mortified to say previously. It takes the compassion and understanding of those around to navigate the unknowns of the brain injury. And good for you going NoWri! Each writer must choose what to do or not to do. 2012 was my first NaNoWriMo and it helped me finish the novel draft that took me 6 years to write! The next year I wrote a complete first draft without any previous attempts, and this year I plan to write the first draft of my first historical novel which I’ve been researching. Each one has been different, but each has resulted in material. That material is never “complete” at the end of November–it is only the beginning. And November is not the only time to draft. Stick by your family! Thanks Charli. It really wasn’t much of a choice for me as family will always be first. There will be plenty of time to write and luckily the only pressure I have is the pressure I put on myself. Right now we are both enjoying this process of helping my son and stressing about it. Hopefully he will get the program he wants at the school he wants. Do you think we can arrange for your son to talk to mine? I’d love for mine to acquire a little of his ambition. Beautiful and loving post. I hope your son does read it- and appreciates it, but from everything you’ve written, I have no doubts that he will. Sounds like a wonderful, well-rounded young man, that you and your wife have every reason to brag about. I hope Liam does read this at some point Bill. It is so well written and your love for him is in every word. Being from the UK I don’t begin to understand the significance of half of the US sports and academic references made here but I do understand their importance to you and your family. I wish your son all the best with his future and hope he gets where he wants to go – I don’t doubt for one moment that he will. It’s so wonderful to read about your son’s hard work, passion and potential! You must be very proud parents. Thanks for reading! And yes, very proud. Wow, what a great post, Bill! Your son sounds like an amazing person and he obviously has great parents. So glad to hear that the concussion issue is better. My only question is: does he still listen to country, or did that go away when his brain healed? Thanks Mary! The country music obsession went away. The tea obsession stayed. Just reading what your son is doing makes me tired! What a wonderful young, spirit in your son. I think I should introduce him to Sam someday. Two of a kind, a bit rate in today’s youth. God Bless You and Your Wife for raising such an incredible young man. I truly believe they end up where they are suppose to be. Enjoy the ride, as it is just beginning. I have enjoyed your writings and your thoughts. Thanks so much for reading Julie! They just might meet someday. If she plays anywhere close to us, we will make the trip. We would love to see her play. This is one amazing kid. And may I say, an amazing set of parents! Thanks so much! We are proud of him. Thanks Ruebi! His hard work is paying off (see my part 2 to this post). Thanks for reading and commenting!